On the 18th and 19th of January 2019, the University of Amsterdam (UvA) hosted a workshop titled ‘Imagining a territory. The construction and representation of territory in late medieval Europe’. The premise of the workshop organised by the ‘Imagining a territory’ project (NWO/ UvA) was the fluidity and multiplicity of the concept of territory in a period before the availability of accurate scale maps, and before the use of this concept in secular political thought and practice. Scholars were invited to discuss the ways in which this modern concept can be used as an analytical tool in medieval studies. By using administrative, cartographic, heraldic, narrative and military sources for specific geographical and historical case studies, all participants have presented inspiring perspectives on the dynamics between the construction, maintenance and representations of late medieval territories and territorial affiliations, and as such contributed greatly to ongoing debates on this topic. Arguably, the concept of territory does allow us to grasp premodern relations between people, power and spaces, as long as its meaning is not narrowed down to simply an enclosed geographical area. This hypothesis formed the backbone of the keynote lecture delivered by the NWO Project’s leader, Mario Damen (UvA). Central to his lecture were three case studies: (1) a fascinating narrative source from the end of the thirteenth century, which describes the battle of Woeringen (1288), (2) the intitulatio of the dukes of Brabant and their successors, the dukes of Burgundy, and (3) the importance of heraldic signs as communication tools. Whereas the first case study allowed Mario Damen to present an innovative approach to the analysis of late medieval spatial references and vocabulary, the second revealed how the dukes (and other political actors) used their intitulatio to express territorial claims. Thirdly, it became clear that the territorial claims expressed by the dukes’ intitulatio could be communicated to a wider audience via diverse visual media, such as heraldic signs. The three speakers of the first session all discussed possible methodological approaches to medieval representations and perceptions of territory and territorial affiliations. The first speaker was Rombert Stapel, who is currently assembling a dynamic multi-layered map of the low countries. By integrating demographical data (ex. hearth counts) and data on peoples’ mobility (ex. travel routes of messengers, merchants and political actors) in medieval Brabant, his research project will reveal the dynamic network of settlements in Brabant and the Low Countries. The second speaker was Jan Trachet, who is taking a landscape-archaeological approach to the Liberty of Bruges. His research on the small port town Monnikerede asks for a combined analysis of archaeological and historical sources, as well as a reconstruction and analysis of the topographical details on the Pourbus painted map of the Liberty of Bruges. The third and final speaker of the first session was Sander Govaerts. By taking a military history approach, he was able to shed light on medieval territorial practices in the Meuse region. According to Govaerts, medieval political actors did have a ‘conceptualisation’ of territory, since military fortifications as well as the organisation of military service allowed them to manage and control the relationship between people, power and space in a specific region. The second session dealt with the ways in which medieval (political) actors perceived and ‘constructed’ the territories they were managing and living in. Jim van der Meulen (Ghent university) presented his research on the possibly decentralising impact of the increasing number of lordships in the duchy of Guelders in the period 1325-1570. Remarkably enough, these lordships contributed greatly to the duchy’s territorial integrity since they functioned as an efficient ‘buffer zone’ between Guelders and its neighbours. Secondly, the paper presented by Luca Zenobi (University of Oxford) dealt with the link between territory and state formation in medieval Italy, and proposed a new conceptual approach. His case studies allowed Luca to convincingly demonstrate that, when compared to the importance of political networks, the concept of ‘territory’ was of lesser importance and/ or meaning to political actors in Italy. In fact, the Italian states functioned – and were perceived – as network states rather than territorial states. The next day started with another session on ‘the construction of territory’. Yannick De Meulder (University of Antwerp) kicked off with a presentation on the possible existence (or contemporary perception) of a capital town in the Low Countries under the reign of Margaret of Austria and Mary of Hungary. Yannick’s reconstruction of the itineraries of both rulers made clear that they did reside in specific cities for specific reasons. While they resided mostly in Mechelen and Brussels, Margaret and Mary clearly did not consider one of these cities as the capital, nor did members of their court or the inhabitants of both cities. With his paper, Michael Depreter (University of Oxford) was able to shed new light on the possible benefits and pitfalls of the analysis of diplomatic sources when studying the construction of late medieval territories. By analysing diplomatic letters dealing with various conflicts between urban and noble elites in England and the Low Countries, Michael studies what one could call the construction of a ‘Burgundian’ juridico-political’ unity. The fourth session dealt with the representation(s) of late medieval territories and territorial affiliations. In order to illustrate the dialectic relationship between the individual (writer) and the collective (audience), Lisa Demets (Ghent University) analysed the Flandria Generosa tradition. This fifteenth-century chronicle narrates Flemish history from a Bruges’ perspective, and as such illustrated how medieval actors could use the written word to construct (and represent) territories and territorial affiliations. Specific urban ideologies deriving from pro- and anti-Burgundian faction strife in late fourteenth- and early fifteenth-century Bruges are recognisable. Additionally, visual sources such as heraldic signs also contributed to the representation and claims of (the control over) specific territories. For instance, the tensions between bishops and the urban commune in late medieval cathedral cities could rise high. Marcus Meer (Durham University) argues that heraldic signs were deeply involved in the negotiation of political power between bishops and the urban commune in late medieval cathedral cities. This was only possible because the inhabitants of Chur, Worms and Augsburg perceived heraldic signs in a direct relation to the urban space they occupied. Heraldic signs therefore are a vital aspect to the concept of territory in the premodern period. Bram Caers (Leiden University) and Kim Overlaet (University of Amsterdam) worked together on a case study on historical ‘territorial practices’ (or performances) in an urban setting to gain insight into the dynamic relationship between the version of Brabantine history present in the vernacular written sources (chronicles) and the ways in which Brabantine history was represented, performed and interpreted in the urban spaces. Central to their paper were the performances of ‘The Wars of Grimbergen (mid-12th Century) and the fight between Silvius Brabo and Druon Antigoon during the Joyous Entry of Duke Maximilian in Antwerp in 1478. Janna Coomans (University of Amsterdam) opened the last and final session of the workshop with a presentation on the mobility of thieves in Deventer and Kampen (1450-1500). Her analysis of lists of criminal confessions allowed her to reconstruct two main routes, one by land and another by sea, illustrating the remarkable scope of the ‘criminal network’ in Deventer and Kampen. The recorded items stolen and the locations from where they were taken, suggest that the thieves belonged to a highly mobile lower middle class. 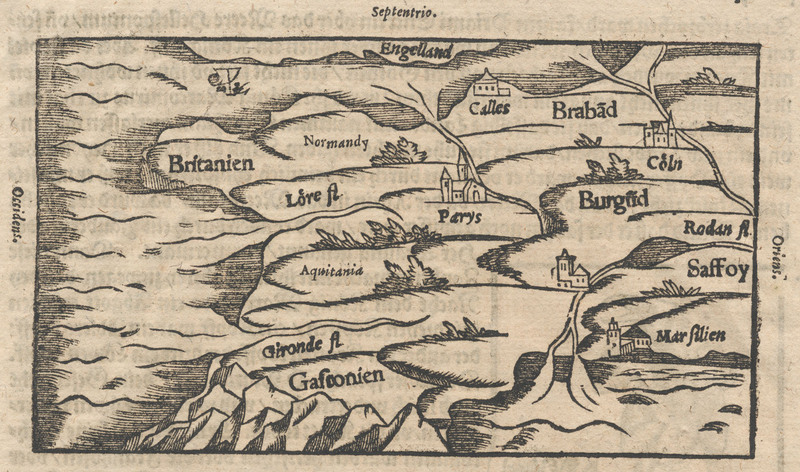 Secondly, Paul Fermon (Aix-Marseille University) stated that ‘the rise of territorial cartography throughout the 15th century contributed to binding the places of power of the principalities with the margins of their jurisdictions’. The cartograph-officers were an important factor in this process. They investigated a particular territory, gathered territorial knowledge to report and made a map of the area under investigation. In order to make a map, apparently three ‘key-items’ were necessary: wandering, seeing and pointing. The final presentation was given by Marianne Ritsema Van Eck (Leiden University). When looking at cartography, she argued, one should not (only) emphasize the ‘accuracy and details’ of those maps. When taking a contextual approach, maps can reveal way more than just an accurate account of an area. Taking the Holy Land map in Francesco Quaresmio’s Elucidatio as a case study, Marianne showed that this map is a historically situated cultural artefact with a particular strongly territorial intent. Instead of portraying the Holy Land exclusively as a devout space for pilgrimage, the map portrays the Holy Land also as a Franciscan territory. Of course there was also room for discussion. Fortunately, Peter Stabel (Session 1), Robert Stein (S.2), Jelle Haemers (S.3), Graeme Small (S.4) and Arnoud-Jan Bijsterveld (S.5) willingly accepted our invitation to lead the discussions in the workshop’s sessions. One of the main themes of these discussions was the question how useful (and possibly dangerously anachronistic) the modern concept of ‘territory’ is when studying the Middle Ages and the Early Modern Age. Some of the participants proposed alternatives for the term, such as ‘principality’. Arguably, ‘territory’ is a geographical term, while the contemporary concept ‘principality’ was used to represent claims of authority in a specific space. Clearly, there is an urgent need to reflect more upon the components constituting modern concepts such as ‘territory’ and ‘borders’ or even ‘states’. One cannot assume these concepts’ meanings to be static and linear. Moreover, the final discussion made clear that even the modern concept ‘territory’ can have varying meanings depending on the focus on, for example, legal or jurisdictional aspects. Secondly, the ‘agency’ of the individuals involved remains a highly important factor. According to Graeme Small and others, when studying premodern territorial affiliations and claims, it is vital to ask questions such as: Which people were involved? Who was aware of the power claims to specific spaces? In order to answer such questions, more attention should be paid to a reconstruction of the specific geographical and historical context. For instance, to what extent had the guildsmen in Bram Caers’ and Kim Overlaet’s case study been free to choose the themes of their tableaux vivants? And who were the townsmen of Chur, Worms and Augsburg, who fought so relentlessly for control over the urban public spaces. Unfortunately, Tom Johnson and Arend Elias Oostindiër had fallen ill and were not able to present their papers.